Sometimes things don’t work out as planned. You probably intend to pay off all of your loans, but life can surprise you in a number of ways—a job change or health event can quickly throw you off track. So, what happens in those worst-case-scenarios? Eventually, you may “default” on your loans, and it’s important to know how that affects you, your finances, and your credit. Not surprisingly, defaulting on a loan comes with consequences. The specifics depend on your situation (such as the type of loan, described below), but you can usually count on damage to your credit and additional expenses. Credit and legal troubles: Your credit will suffer when you fail to make your required payments. For the first 30 days after payment is due, you’re probably in the clear. After that, lenders report missed payments to credit bureaus, resulting in lower credit scores. Lower scores make it hard to secure loans in the future, and low credit scores can impact several other areas of your life. For example, you might have a harder time renting, finding a job, signing up for utilities and mobile phone service, and buying insurance. 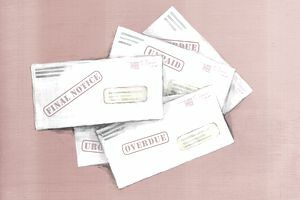 Eventually, unpaid debts can be sent to collection agencies. Collections damage your credit, can lead to legal judgments against you, and can be expensive. As time progresses, lenders might be able to garnish your wages or even take assets from your bank accounts. High expenses: To make matters worse, your financial burden will probably grow if you default on a loan. Late payment fees, penalties, and legal costs might be added to your account, increasing the total ​balance you owe. Depending on the type of loan you default on, different things can happen. Secured loans: If a loan was secured with collateral like your home or car, the lender can potentially take that property and sell it. Personal loans: For unsecured loans (which have no linked collateral), lenders can only damage your credit and try to collect by taking legal action. Home loans: If you bought or refinanced a home with your loan (or borrowed against it with a home equity line of credit or second mortgage), your lender might be able to force you out through foreclosure and sell your home to collect the loan balance. If the sale doesn’t cover the entire amount you owe, you might still owe the difference or “deficiency,” depending on state laws. Automobiles: Auto loans are similar. If you default on a car loan, the vehicle can be repossessed and sold. Again, you might owe any deficiency if the car sells for less than you owe (which can happen due to quick depreciation, or if you’ve somehow managed to go upside-down on the loan). Repossession is possible for the original loan you used to purchase the vehicle and any title loans you’ve taken for extra cash. The IRS can withhold tax refunds to pay off the debt. The Department of Education can garnish your wages very easily. You might receive lower Social Security payments. Credit cards: Defaulting on a credit card loan is probably the most painless default, but your credit will certainly suffer, and your account will likely be sent to collections. Expect to see fees added to your debt, and collection agencies will make endless phone calls and other attempts to collect. Given the consequences, it’s best to avoid default. Doing so keeps your options open—you can always default later, but it’s hard to clean things up after you cross that threshold. Your lender gets a heads up and has the opportunity to (potentially) work on a solution with you. The lender sees that you’ve simply stopped paying, so they start making efforts to collect. The first option is best for everybody involved. If you work out any kind of “arrangement,” document all communications, and get agreements in writing before taking action. You might have to provide personal information like your monthly income and expenses, but any type of assistance program requires those details. The only way to know what your options are is to speak with your lender. With student loans, your loan is in default after 270 days. Contact your lender quickly so you can line up everything well ahead of any deadlines. Home loans can create crushing debt burdens, and there are several ways to deal with that debt. Loan modification may provide relief and allow you to keep your existing loan in place. Several government programs exist to help homeowners in trouble. Refinancing may help you lower your monthly payments, but you’ll need to qualify for the loan (government programs may help if you’re already having difficulties). For debt in general, it might be helpful to talk with a licensed credit counselor who can help you evaluate your financial position and even set up a debt management plan (if appropriate in your situation).